Dwarka is an ancient city located in the state of Gujarat and as a part of the char dham yatra it is one of the foremost Hindu pilgrimage sites. This legendary town has been mentioned multiple times in ancient literature, one of them being that it was the very first capital of Gujarat during the ruling of Lord Krishna. Set majestically by the banks of the Arabian sea, Dwarka enjoys tourists throughout the year, who pay their visit here as a part of their char dham yatra, relax in the sandy beaches or visit some of the most iconic Hindu temples in India. People avail the travel package for Dwarka with an aim of not just exploring the ancient temples but also visiting some of the most picturesque, scenic and quaint tourist spots. Here are some of the most famous places in Dwarka which you must visit, the next time you plan a trip to the enchanting town of Dwarka. Dedicated to Lord Krishna this temple attracts a large number of crowd throughout the year. Adi Shankaracharya visited this very temple in the 8th century making it a prominent holy site along with being included as a part of the char dham yatra. Ever since its establishment, this temple has been enlarged till the 15th and 16th century, in order to accommodate more visitors every day. This iconic temple is a must visit site for every religious individual looking for a holiday filled with spirituality. Located at a comfortable distance from the Dwarkadhish temple is one of the major tourist attractions in Dwarka. Witness some of the most splendid sunsets on the horizon and relax on the pure, sandy Dwarka beach. The blue open sky above along with the cool ocean breeze, a visit here will definitely rejuvenate your senses and will be one of the best ways of spending your vacation days. Gomati ghat is significant since one of the tributaries of the holy Ganga River flows along this ghat. The ghat is located strategically on the mouth of the river, which later confluences with the Arabian Sea. Gomati ghat is visited by devout pilgrims who walk down the 56 steps of the Dwarkadheesh mandir Swargadwar to reach the ghat and wash away their sin by taking a dip in the holy water. Having this temple’s name mentioned in the Shiva Purana and located on the Beyt Dwarka Island, this temple is dedicated to Nageshwar Mahadev, which symbolizes the protection from all types of poison. What makes this temple unique and a must visit, is the fact that the Shiva Linga enshrined here is facing towards the South; another unique feature includes a giant statue of Nageshwar Mahadev Shiva Lingam. 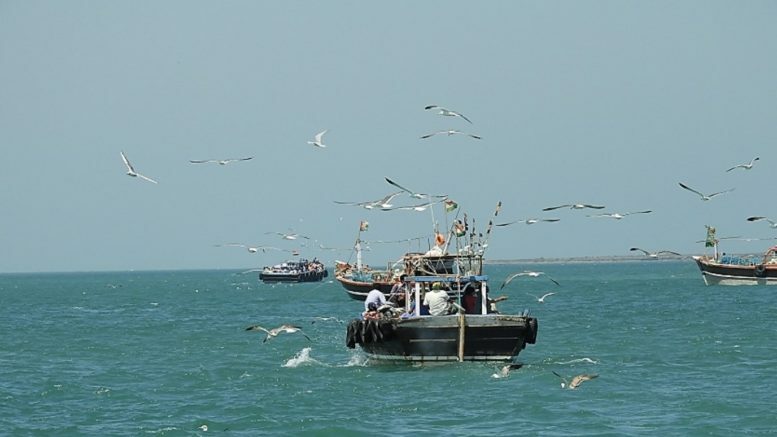 Located at a distance of 30km from the main town of Gujarat is a small inhabited island of Bet Dwarka which can be reached via a ferry. This island is filled with a number of wholesome tourist retreat experiences which include visiting temples that date over 500 years, relaxing beaches and mesmerizing coral reefs. It is also a pilgrimage site for devotees since it is believed that this was Lord Krishna’s residence place. All these features put together makes this place a must visit location. Enveloped by the blue shimmering sea and coral reefs this point is the very first eco-tourism site in Gujarat. One can go for a swim in the water to cool off or just sunbathe on the shore and relax their time away. Marine life is available in plenty here like dolphins, turtles, and a variety of fishes. One can also opt for activities like, beach camping, water polo, cruise, bird watching or even kite flying. If you are looking to spend your time in a fun and relaxing manner then you must plan a visit to this place. Constructed recently with an aim of connecting the Shore of Gomati River to Dwarkadheesh temple, this walkway bridge is a great option if you are in the mood to take a refreshing stroll. With a nominal fees charge of 10 rupees you will experience one of the finest walkways in India which will not only spiritually evoke you but with the mighty river flowing below your feet it will also be a one of its kind experience. This sacred pond is located at a comfortable distance of 5 km from the Nageshvara Jyotirlinga temple; this pond is not just known for its serene and tranquil beauty but is also an important pilgrimage site, since this is believed to be the same pond where the gopis used to come to visit Lord Krishna in Dwarka. Currently this pond serves as a recreation spot where one can spend some quality time with their family by the water and have a picnic (make sure not to litter the place). This incredible temple is located in the western part of Dwarka on a gorgeous hillock in the sea which is the confluence point of Rivers Gomati, Ganga and the Arabian sea. The temple can be reached easily during the low tide times using the steps that are present which lead up to the temple entrance. With the presiding deity being Lord Chandra-Mouliswar Shiva the temple’s picturesque location, surrounded by water works as a huge tourist magnet. Situated close to Bhadkeshwar mandir, this temple is one of the most interesting and a unique temple in India. Built with an aim to protect the teachings and values of Bhagvad Gita (holy book of Hindus), this temple has walls that are covered with the carvings of hymns from Bhagvad Gita. The ceiling of this temple is also designed in a very special manner so that each voice within the temple walls is echoed.This pure marble structure gives off a glorious and radiant vibe which attracts tourists from far and wide. Be the first to comment on "Top 10 Famous Places To Visit In Dwarka"